I teach mindfulness to all my clients at some point in our work together. Because without mindfulness, they will fail to achieve their goals. Meditation is useful for some of my clients. But many of them don’t meditate and don’t need to meditate. They have other practices that give them all the benefits of meditation. In common usage, many people use meditation and mindfulness interchangeably, but there is an important distinction between them. Mindfulness is a state of awareness. It is the quality of consciousness about things – a way of paying attention to what is happening right here right now without judgment, commentary, or interference. Mindfulness can be practiced anywhere, anytime, with any point of focus. Sitting meditation is done sitting. Walking meditation is done walking. Meditation may be performed with mindfulness, but it may also be performed with a different quality of mind. Meditation may be used to cultivate a specific state of mind, the three most common being increased focus, relaxation and loving kindness. Pure mindfulness counteracts the tendency to live in the past or the future. It brings the details of the present into focus. 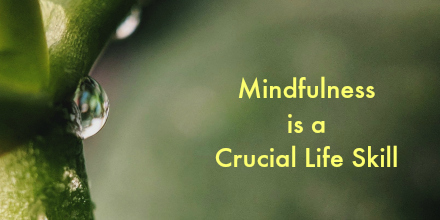 Practicing mindfulness teaches the conscious mind to notice that things are always changing and to become comfortable noticing that change as it is happening without reacting to it impulsively. This is a crucial mental capacity for life in the modern world. Not very long ago, social and cultural change happened slowly. We had time to adapt. Now, systems that worked for generations have fallen apart and new systems emerge and change with high frequency. If you want to look closely at why and how this has happened and why things have sped up and continue to speed up, check out Thomas Freidman’s book The World is Flat. Uncertainty is the central experience of contemporary life. Parents and schools don’t know what future they are raising children to face and what skills or qualifications they will need. Job security is a thing of the past. Climate change, just-in-time employment, rapidly increasing automation, and globalization of the work force all contribute to a constant sense that not only are we building our lives in earthquake territory, but we are building during the earthquake. Without mindfulness training, the human brain tends to interpret each change as a reason to panic. And when we panic, our amygdalae kick into gear and pump out the chemicals that signal our bodies to divert all energy to the defense systems: flight, fight, and freeze. All the energy goes to primitive defences and our cognitive processing goes off-line, just when we need it most. Mindfulness training teaches the body that it is safe to be in the presence of change. This sense of safety means the amygdala chills out and our cognitive processing stays active so we can make decisions about how to react to the present moment. We still need to learn from the past – though learning from the past gets harder as the present becomes more different from the past. And, we still need to think about what possible futures we are trying to build. Mindfulness helps us stay in the dance between the past, present, and future. What didn’t work in the past? How is this situation the same as what we have seen before? How is this situation different from what we have seen before? What action can we take right now from here that will take us toward our goal? Human beings need a sense of control and capacity to effect change. Consciously asking ourselves these questions in all aspects of our lives and then taking action based on our answers gives us a sense of power and control even as things change rapidly around us. Mindfulness focuses our attention on the specifics of this moment, this situation, this unique moment in time. What About Meditation? How is Meditation Helpful? All meditation practices involve creating time and space to slow down and focus on a goal. Slowing down is good for us. It makes us feel safe and allows our amygdalae to rest. Simply taking time to meditate calms the body. The relaxation effect of meditation is valuable in and of itself. However, there is nothing specific about meditation that has this effect. Any activity that creates an opportunity for you to deeply relax will have the same impact. Yoga, nature walks, sailing, running, reading a novel, painting, knitting, or getting a massage—the list could go on and on, but only some of them will work for you. The particular focus of meditation helps cultivate some quality or skill. If you enjoy meditation and have an internal skill that you want to cultivate, some form of guided meditation can be very powerful. Guided meditations are typically designed to lead listeners into a trancelike state where hypnotic effects occur. Once in that state, the particular change being encouraged has a chance to sink in and have an impact. If it works for you, by all means use it. But if it doesn’t, know that any form of intentional practice to cultivate a quality you want can work. Find what works for you, it might or might not be meditation. Mindfulness is a crucial part of thriving in the modern world. No matter how you spend your time, the world around you is busy and changing fast. Mindfulness practices help you get better at seeing what is true right now and right now and right now without freaking out. Not freaking out is crucial to being able to choose how you live your life. Without mindfulness, you are likely to find yourself a victim of circumstances, reacting to everything that gets thrown at you without a sense of stability. Mindfulness allows you to become still and centred despite the whirlwind. Practicing mindfulness is as simple and as hard as bringing your consciousness to the present moment and noticing you are aware of. We have 7 senses, the traditional 5 plus interception (awareness of internal sensations like hunger and pain) and proprioception (awareness of where our body is in space). Mindfulness involves noticing the data in one of those perceptive channels at a time. No analysis. No judgment. Just noticing. In many traditions, the instruction is often to label the sensation. Simply naming what you notice is an active thing to do and is therefore a better point of focus than to not engage in analysis or judgment. Meditation requires setting aside a chunk of time. Mindfulness can be usefully practiced in one or two breath chunks. You can do it anywhere, anytime. Pick a sensory channel and notice what sensations are coming to your awareness through that channel for the length of two breaths. The impact of mindfulness training is cumulative. More practice leads to faster growth. Do it every time you think of it. Like any other behaviour, it takes time to become habitual. Put reminders where you will see them to keep you coming back to the practice when you forget. You will forget and get distracted. Just begin again.